Following the announcement of two new iPad models, the 7.9-inch iPad Mini and 10.5-inch iPad Air, and updates to the iMac, Apple has revealed today the much rumoured new generation of its AirPods wireless headphones, now featuring a Qi- Certified wireless charging case. Apple firstly introduced Qi wireless charging in its range with the launch of the 10th anniversary iPhone X model, together with the iPhone 8 and 8 Plus in 2017. These were then followed by the iPhone XS, XS Max and XR in 2018. Despite being pretty identical to the initial model, the new wireless charging case utilises the Qi standard from the WPC, meaning that it can now be charged on any Qi-Certified wireless charger without the need of using the Lightning cable. An LED indicator on the front of the case will let users know that the AirPods are charging. 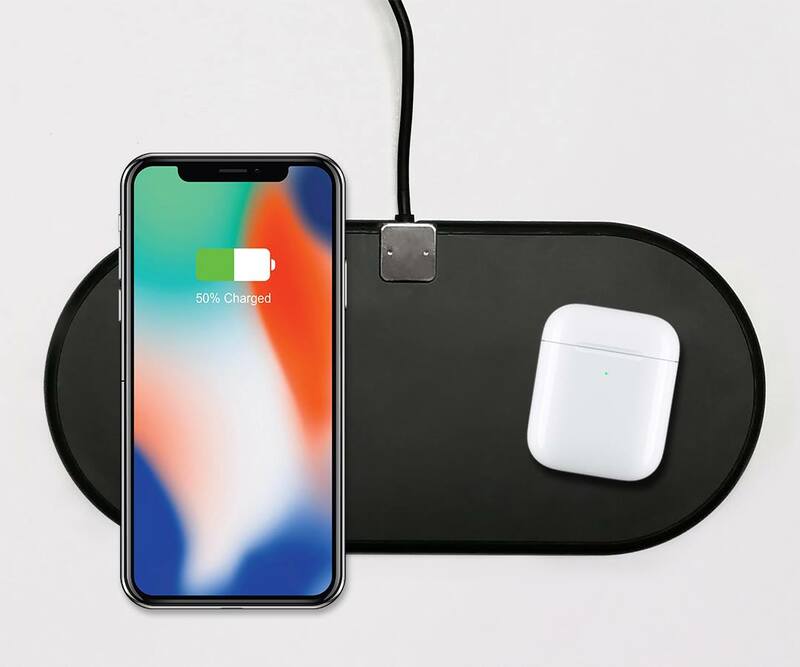 Aircharge offers an extensive range of Apple-compatible chargers, including the new Aircharge Fast Dual Charger, allowing you to charge both an iPhone and the AirPods simultaneously. In addition to charging at home, the AirPods can be conveniently topped up also in offices, cars and public venues such as restaurants, coffee shops, hotels, airports and train stations, providing wireless charging points. To access all publicly available wireless charging location, simply download the Aircharge app. Owners of the standard first-generation AirPods will be able to upgrade to the new case or as an alternative, opt for a wireless charging adaptor like the Apple Certified Aircharge Keyring. Simply connect the Aircharge Keyring Adaptor to the AirPods case or another Lightning devices like the iPhone 5/SE/6/6s/6 Plus/ 6s Plus/7/7 Plus, or the iPad Mini to enjoy the freedom of wireless charging. And with an integrated Micro-USB connector, you can also charge other accessories like wireless headphones, GoPro cameras, PS4 and Xbox controllers and more.